Those going to Cold Pursuit expecting a typical early-year Liam Neeson action thriller may be disconcerted by what Norwegian director Hans Petter Moland delivers. On the surface, this is a standard-order revenge movie: a snow-plow driver, Nels Coxman (Neeson), tracks down the assorted thugs and drug dealers responsible for the murder of his (innocent) son. He dispatches them one-by-one, seemingly not feeling a lot of guilt for his actions, as he climbs steadily up the food chain. However, Moland doesn’t play it “straight.” Cold Pursuit has a strong current of dark humor winding through the proceedings. With a nod or two to Quentin Tarantino, he has fashioned a bizarrely entertaining ode to violence, gangsters, and heavy snowfall in the Rockies. Cold Pursuit, which Moland has adapted from his own 2014 film, In Order of Disappearance (which starred Stellan Skarsgaard in the Neeson role), has some structural problems. There are too many tangential subplots that go nowhere and two characters – police officers John Gipsky (John Doman) and Kim Dash (Emmy Rossum) – serve little purpose beyond providing amusing banter and tossing around bits of exposition. In addition, although Neeson features prominently in the first third and last third of the film, he is absent for long periods during the middle portion. This allows for the development of a gang war between the Big Bad Drug Dealers, led by Trevor “Viking” Calcote (Tom Bateman), and the Native American brothers of White Bull (Tom Jackson). Although that rivalry is important to the resolution, its incorporation is awkward. Moland starts out his tongue-in-cheek approach by interrupting proceedings with an intertitle every time someone is killed (it features the person’s real name, gangster nickname, and a cross). Since the body count in Cold Pursuit is high, this happens frequently. There are times when characters engage in dialogue that could have been excerpted from a rough draft of Pulp Fiction (generally speaking, it’s not as clever as anything Tarantino wrote). A typical example features a group of Native Americans trying to get a room at a high-end hotel that requires all guests to have “reservations.” The gallows humor is pervasive, giving the production, which sometimes crosses over a line into outright parody, a quirky tone. This isn’t a white-knuckle affair. It’s an interesting twist to have the protagonist driving the big, ominous piece of machinery. High-volume snowplows of the variety used to carve out paths through the dune-like snows of the Rockies (the movie is set near Denver but was filmed in Western Canada) are dangerous vehicles and having Neeson behind the wheel makes him a formidable opponent for even best-connected thugs. The cinematography, by Philip Ogaard (who filled the same role in In Order of Disappearance), emphasizes the starkness of the land with imposing mountains and plains of unbroken white. Nevertheless, the scenes that impressed me the most were the ones that show the plow at work in a true man vs. nature struggle we can all relate to (or at least those of us who live in snow-producing climates). According to Neeson, this is his last action role (an assertion he may have unintentionally enforced by making controversial statements in a pre-release interview for this movie). He plays Nels the way he has played every other dogged hero in his stable with icy determination and unwavering fortitude. He does his killing calmly and without accompanying one-liners. As the villain of the piece, Tom Bateman combines a wicked sense of humor with just plain wickedness. His idea of parenting is to give his son (Nicholas Holmes) a copy of The Lord of the Flies and tell him the answer to all life’s problems are found therein. When his ex-wife (Julia Jones) is berating him, he makes a comment about having once loved her lips. Bateman is effective as much for his sophistication as his evil. Other familiar faces with small roles include Laura Dern (as Neeson’s wife), William Forsythe (as Neeson’s brother), and Domenick Lombardozzi (as a henchman). Cold Pursuit belongs in the same category as Bad Times at the El Royale and Baby Driver. It’s better than the former but not as good as the latter. 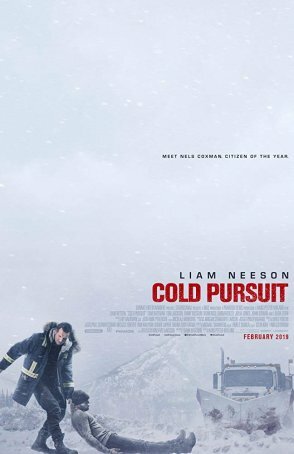 Neeson’s comments have added an unplanned layer to viewing the film but, putting them aside, Cold Pursuit works as intended.